When you're thinking about having a baby, it's really important to maintaining a healthy balanced diet. Eating healthy food is important for maintaining optimal health throughout life, more so for an expectant mother. Moms-to-be should include lots of foods that are folate-rich in her diet and maintain a healthy diet all throughout the pregnancy. A pregnant mother should make a conscious effort in choosing what foods to eat and when to eat as eats not only for herself but also for the bundle of joy growing inside of her. Food ingested during your pregnancy directly affects the unborn baby so it is essential to get nourishment that the baby needs to grow and develop fully. 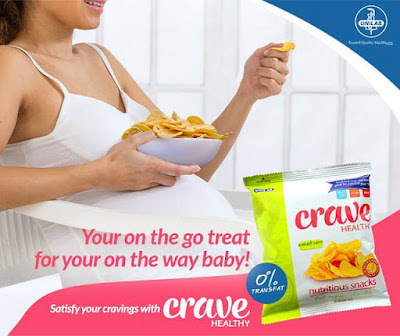 It is a good thing that there is Crave Healthy to satisfy hunger pangs and food cravings of pregnant women..
Crave Healthy is specifically designed healthy snack for the pregnant woman by doctors and nutritionists. It’s nutritious because it contains essential nutrients----Folic Acid, Iron,and Calcium that are critical for the expectant mom and her growing baby. Its salt content has also been reduced salt and contains just the right amount of calories to give the pregnant woman that extra energy she needs daily. Crave Healthy is delicious as it tastes just like any other regular snack. Crave Healthy comes in Sweet Corn flavor and does away with any aftertaste of nutrient fortifications. It provides the nutritional needs of pregnant women to have a normal, balanced, healthy diet for their developing fetus. It is a breakthrough healthy snack for pregnant women that uses all natural ingredients. A 30-gram pack of Crave is worth P 25.00 and maybe purchased online at www.cravehealthysnacks.com or via Lazada Online Shopping http://tinyurl.com/CraveLazada, select Med Express branches, and select Robinsons Supermarket outlets.